How much does it cost to travel to Liechtenstein? How much money will you need in Liechtenstein? Additional pricing is in the table below. These average travel prices have been collected from other travelers to help you plan your own travel budget. Landlocked by Switzerland to the east and Austria to the west, Lichtenstein is a small 25 kilometer-long country with beautiful alpine scenery. As a last remnant of the Holy Roman Empire, the country is also characterized by historic sites, medieval castles, and picturesque villages. Being a small country, Lichtenstein is less divided by regions and rather distinguished by its towns and cities. Vaduz, for example, is the nation's capital where visitors can explore the grounds around the city's castle, learn local history and culture at its museums, and enjoy views of the Swiss Alps towering above the Rhine River. Schann, just to the north of Vaduz, is Lichtenstein's largest city. Other destinations include the church and castle of Balzers, the skiing and snowboarding area of Malbun, the historic town of Triesen, and the alpine town of Triesenberg. A handful of additional towns include Ruggell with a nature reserve of rare plants and animals, Nendeln with ceramics and Roman ruins, and Schellenburg with a museum of rural homes. Valduz, though it is a largely modern city, is a main point of interest for visitors in this small country. One attraction is the Valduz Castle which is placed above the main city on a hill surrounded by charming woods. A short walk up this hill will bring visitors to the outskirts of the castle grounds where they can find a breathtaking view of the city below with a lovely mountain backdrop. Walking down to the Rhine River to the old covered bridge will also offer impressive views of the nearby mountains. The city itself has a number of interesting museums. The Art Museum, or "KunstMuseum," for example, has a selection of rotating modern art displays, while the National Museum just down the street gives insight into the broad history of Lichtenstein itself. There is also the Post Museum which displays the history of Liechtenstein's postal history as well as all stamps issued over the last hundred years amongst other things. 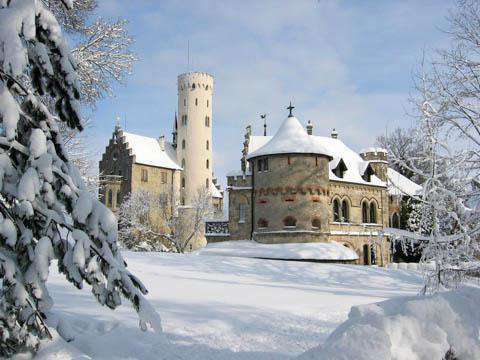 Additional attractions include the Prince's Wine Collection which is available to view by a vineyard on the Northern edge of Vaduz, a ski museum in Valduz, the Cathedral of St. Florin, Burg Gutenberg in Balzers, St. Joseph at Parish Church in Triesenburg, and the ski resort area of Malbun. With its mountain terrain, Liechtenstein offers great hiking, road biking, and mountain biking opportunities. Skiing and snowboarding are also popular in the resort town of Malbun with reasonable lift prices compared to those in the neighboring countries of Switzerland and Austria. Though it is a small country, Lichtenstein does have its own assortment of sightseeing prospects with medieval castles, churches, a few museums, and a gorgeous valley landscape with impressive mountains on either side. In Vaduz there are also places for shopping, where tourists can find a selection of souvenirs to commemorate their visit. Cuisine of Lichtenstein ranges from hearty mountain dishes in the smaller towns to gourmet restaurants in some of the more upscale areas. One typical dish is "Kasknopfle," a doughy kind of pasta made with melted cheese and usually served with green salad, potato salad, or apple sauce. Another common meal throughout the Rhine Valley is "Ribel" or "Rebl." Once the poor man's food, this cornmeal-based specialty is hearty and healthy and generally eaten with coffee, apple sauce, cooked cherries, elderberry sauce, compote, or sour cheese. "Schwartenmagen," or pickled meat in jelly, is also popular. In Vaduz, the main square has a number of caf�s and restaurants serving Liechtenstein, Swiss, and Austrian fare at reasonable prices. There are also a few bakeries which sell fresh rolls and pastries, as well as a McDonald's which is very popular and advertised throughout the country. Due to its small size, Lichtenstein has no airports. There are, however, three international airports within an hour's drive of the country. Zurich-Kloten (in Switzerland) is 115 kilometers away, St. Gallen-Altenrhein (also in Switzerland) is 50 kilometers away, and Friedrichshafen (in Germany) is 85 kilometers away. The easiest way of getting to Liechtenstein by public transportation is to ride a train to Sargans or Buchs in Switzerland, or Feldkirch in Austria, and then take a connecting bus to Liechtenstein. By car, the Swiss Autobahn A13/E34 runs along the Swiss side of the Rhine River, which marks the border between Switzerland and Liechtenstein. There are several access points that cross the Rhine into Liechtenstein - the two that most commonly used are the bridge crossing into the southern town of Balzers and the crossing into Vaduz.